I cannot tell you how many variations of mac n’ cheese and pasta casserole I made during my nine months of pregnancy (and how much more is now in my freezer for what my mamma-friend calls “one-handed, defrost-able meals”). Both dishes, which are essentially the same kin, are comfort food at its core with plenty of margin for creativity (the word I prefer to “error”). The basics are often on hand: a can of tuna, aged bread, pasta shells, cheese, milk or cream, and butter. 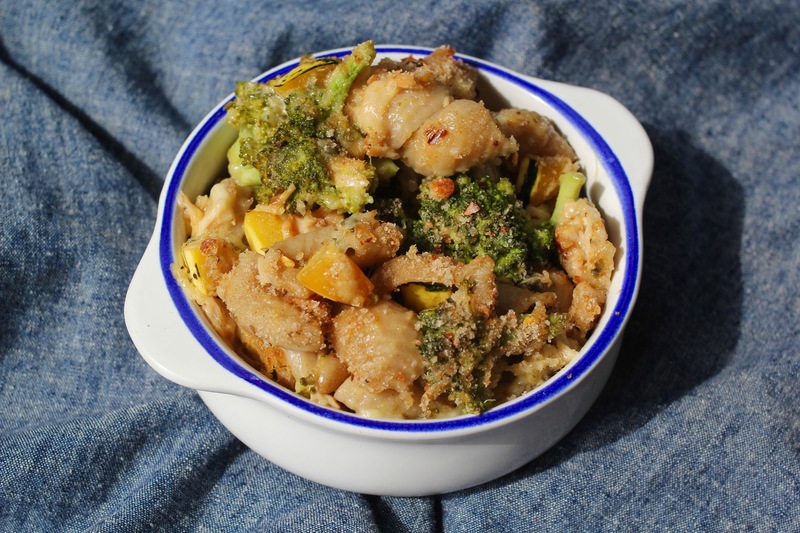 The embellishments – bright and beautiful vegetables and seasoning – can vary based on your seasonal kitchen stock, but I’d recommend trying this particular combination of delicata squash and broccoli. And please, don’t be afraid to char the broccoli – it’s happier that way. You can suffice without the crunchy bread crumb topping if you’re going with gluten-free pasta, or ran out of your latest loaf. But if you have the hard heels still laying around you can watch this video to learn how to make bread crumbs. As for canned tuna, I adore Alaska Gold Brand’s Albacore Tuna, which is pure and righteous in flavor. After my voyage to Alaska this past August, I can attest to the quality if this tuna, which leans on the quality of the fishermen and the majestic oceans in which they drop their hook-and-line. In Baked Coho Salmon with Tamari Peach Salsa and Coconut Miso Coho Salmon I dive into stories from the Alaskan seas that will bring a seemingly simple can of tuna to life. Try it! So stoke the oven, don your fuzzy slippers and make this ultra-comforting, wintry dish for your friends and family. Or make it ahead of time and pull it out of the freezer for an easy meal when you are exhausted from nursing your sweet new baby around the clock! Don't be too strict about sticking to the ingredients listed. You can substitute the delicata squash with any other variety, including butternut, acorn, turban or a classic pumpkin. 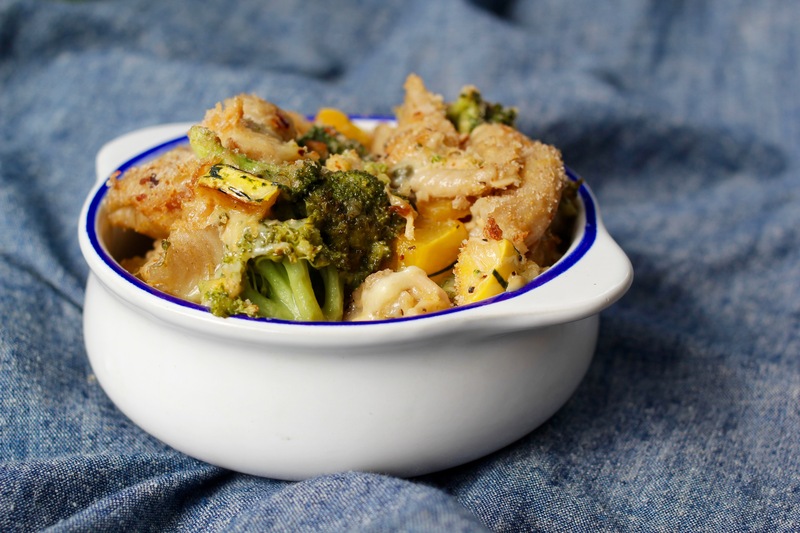 You can also swap the broccoli for cauliflower, and cream for milk (though nothing beats a creamy, cheesy casserole!). Watch this video to learn how to make bread crumbs from "aged" (or what we often call, stale) bread. Bring a pot of water to boil and add 2 tablespoons of sea salt, until the water tastes like a big ocean gulp. Add the pasta and cook until "al dente." While the pasta is cooking, prepare the vegetables. In a large sauté pan, add 2 tablespoons of the butter and melt on medium heat. Add the onion and sauté until caramelized brown. Then stir in the garlic, broccoli and squash. Cover for 5 - 10 minutes, sautéing until the broccoli is bright green and the squash is fork-tender. Drain the pasta, but reserve 1/2 cup pasta water. Add the "al dente" pasta, remaining 2 tablespoons butter and pasta water to the pan with the vegetables, and stir over medium-low heat on the stovetop until the butter melts. Transfer the pasta and vegetables to a baking dish. Mix in the tuna, cream, cheese, capers and black pepper. Sprinkle the bread crumbs over the surface and bake the casserole for 15 minutes, until bread crumbs are toasted.